This summarizes the global FAUCET pipeline; however, certain tables may be omitted if the functionality is not required. 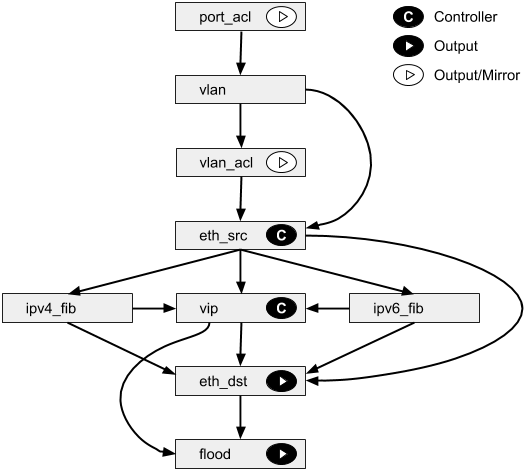 For example, if routing is not configured, neither FIB table nor the VIP table will be provisioned. Usually the OpenFlow table IDs will be allocated sequentially for the tables actually used, so tables should be referenced by their name rather than the table ID in this diagram. See also canonical pipeline definitions in faucet_pipeline.py. Interception of L2 control traffic (e.g. LACP, LLDP if configured). Send traffic destined for FAUCET VIPs including IPv4 ARP and IPv6 ND to the controller, and traffic for unresolved hosts in connected IP subnets (if proactively learning). For destination MAC addresses we have learned output packet towards that host (popping VLAN frame if we are outputting on an untagged port), and where hairpinning is desired (e.g. routing between hosts on the same port, but different VLANS). Unknown traffic is sent to ETH_DST table.